As 2014 winds down, I am grateful for much in my life. I am blessed beyond belief. 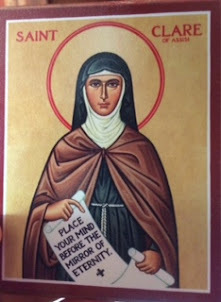 Looking toward 2015 I have chosen Clare of Assisi for my companion. And the word I carry with me will be: ENOUGH. I will explore what is enough in my life. May you find 2015 a year of blessing and peace. I've been enjoying reading books by Jenna Woginrich, as well as her blog Cold Antler Farm. She inspires me with her adventures. Presently, I am reading Barnheart: the incurable longing for a farm of one's own. Each chapter unfolds her growing knowledge abd experience of farm life. I read her book One Woman Farm first and loved it; it's not so much about being independent but rather how farm life is a matter of being interdependent. It speaks of church to me in some manner of speaking without need of building or creed; there was several references to breaking bread and seeing the land and critters as sacred. After many years, we're creating a little homestead of our own! Jenna can run circles around us I would imagine. Recently, we had a homestead event that made us stop and think about our path to simplicity. It was our male goat: he would not be persuaded to stay out of our garden, despite an electric fence surrounding it. Mostly, he left the garden alone, but he once took advantage of my good nature and managed to initially get in the garden as I was getting out. Grabbing his collar, I managed to get him out, but before I could close the gate and alarm the fence, he was munching down on our pea patch. Again I escorted him out, but getting my feet tangled up in the fence, I took a nasty fall! Thinking I couldn't get up at first, I ended up letting Rascal have his way in the garden. My husband arrived and he attempted to rid the garden of the thief--and after several attempts, my Mr. was terribly winded and Rascal was now on to the cucumbers. Hubby frightened me as he clutched his chest. Finally, I managed to get up, commendeered the aptly named goat, moving him to the barn and safely locking him inside. I couldn't decide if I needed to dial 911, but as I approached the Mr. I noted he was ok and breathing well again. We were covered in sweat and tears, when suddenly we looked at one another and broke into laughter. Jenna is a 20-30 something; but we had reached the over 60 crowd in recent years. What were we thinking? Farm life in our senior years? Poor little Rascal was only doing what comes natural to a goat! We had to repair the fence, and add another couple of lines for the electric fence and thankfully, Rascal hasn't even attempted to get back in! We couldn't imagine life without him now, or his sister, Miss Daisy. Our lives are richer for our experience, and we are a lot more careful about getting into and out of the garden. Life over 60? It's grand... and Jenna keeps me dreaming of chickens! Thanks, Jenna! And thank you God for such a beautiful way to grow older! The diagnosis did not come as a surprise, but it did come as a disappointment. Diabetes had been in the family gene pool--and I was aging. So, like most things in my life, I decided to tackle it head on. My first venture into the world of diabetes was to attend a "Super" conference. I managed to drag my husband along thinking we'd learn to manage this disease together. The conference was an even bigger disappointment than the diagnosis. The message I received was basically, eat what you want and just give yourself more medicine. Really? And the lunch--it was full of simple carbohydrates! Needless to say, I wasn't impressed. Although I've been told that a cure for diabetes is always being sought, I have begun to wonder--and not just about diabetes, but many other "chronic" diseases, too. Let's face it, diabetes is BIG business. The testing, the meds, the snacks--like Glucerna. I was surprised to learn that several of their products--like their mini snack bars contain High Fructose Corn Syrup! (See their website, which lists product ingredients). That's a real no-no for those living with diabetes. Even though their product ingredients suggest that the bars only contain 2% High Fructose Corn Syrup (HFCS), why would a product targeted to diabetics contain it at all? Ever read the ingredients on certain products marketed to diabetics? If I can't pronounce it, I'm not sure I want to eat it. Over the years, I've learned to manage pretty well--yes, I do test. I've learned what I can and can't eat (and oh, do I miss bread! ), learned that exercise makes a huge difference, and learned that friends really do help out. I try to do the things I know to do: pray,spend time in contemplation, reduce stress in my life, grow my own vegetables, cook at home, eat lots of salad, exercise when I can, feed and play with my goats, dream about my future chickens and find something to laugh about every day. And did I mention dark chocolate? In moderation, it really helps. To all those diabetics out there: don't just test, but question! Question products marketed to you--especially food products. Are they really helping you manage your disease, or are they keeping you dependant on the BIG business that has become so much a part of the world of medicine. Take charge of your health! And to the great friends who helped me get on a good path--THANK YOU. I may one day have to take medicine, but for now, I'm grateful I've learned what works best for me! For the better part of almost 2 weeks, I have been on vacation. It hasn't really been a "staycation," although we have spent most of our time at home. One day we visited The Apron Museum in Iuka, MS and I learned so many things about aprons I didn't know. It was a step back in time, and I am likely to go back to the museum. Another day, we visited the Tupelo flea market--it wasn't exactly what we expected, but a fun day out. And then on another outing, we visited the North Mississippi Fish Hatchery. A wonderful experience; a great museum and lots of good information as we ponder fish in our backyard. We even enjoyed lunch on that day at The B.T.C. Old Fashioned Grocery. But aside from our littel day trips, we've mostly been home. Home . . . it's a place we often take for granted. Many of us are so busy making a living and buying stuff that we're hardly ever home; we don't have time to enjoy the fruits of our labor. Being home these days has made me hunger for more. We have worked in our vegetable and flower gardens, played with and cared for our mini-alpine goats,cat and dog, cooked more from scratch (including a chocolate pie for the mister! ), kept the house neater, had REAL conversations, read more and relaxed more than any recent vacation I remember. There has been time for deep prayer and soulful meditation. Time to enjoy God's bountiful creation. Time to listen to the music of my generation and remember Woodstock nation's call to getting back to the garden. Time to reflect on where I've been, and where I'm going. I will return to my position well rested, but with a hunger for home and our little piece of Paradise. Robert Frost once wrote, "Home is the place where, whey you have to go there, they have to take you in." Maybe that's true. But I think Dorothy ( of the Wizard of Oz fame) got it right when she said "There's no place like home." Since I was a little girl, I have dreamed of owning goats. My father always wanted a goat, so that may be the reason I found an interest in them. And now, they are gracing my back yard--two mini-alpines--a brother and sister! The little buckling soon to become a wether, and the little doeling we will breed later so that we can realize our dream of milking. It's an adventure--and a learning curve. So far so good! 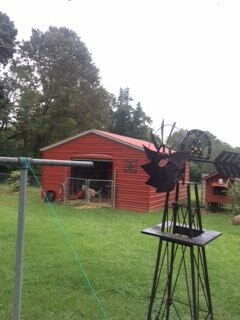 I like the rhythm of the day -- feeding and watering (and one day milking) twice a day--it is like the rhythm of prayer in the Episcopal Church--Morning Prayer and Evening Prayer. I am grateful for the opportunity and the call to prayer. Next, we will choose a name for our little place--such serious thought. Then on to planning for a few chickens and hopefully a worm composting adventure! Life is good! The book was on the shelf; I'd received it as an ordination gift. Never read it--just sat there, until a colleague used it for an opening meditation at a recent meeting. Later, after a long week, I took the book from the shelf and thumbed my way through--finally resting on and savoring on a meditation/poem. The book is called Prisms of the Soul: Writings from a Sisterhood of Faith, edited by Marcy Darin. I believe it is out of print now (1996); but worth the trouble to find a used copy. tied at the nape of her neck. and to dance, to dance? Thank you, Patricia Flower Vermillion! I hope to wear black stockings and aprons and cover my head with cotton scarves (as I explore headcovering), and yes . . . I hope to dance--and learn more about Puccini as I journey with Jesus!